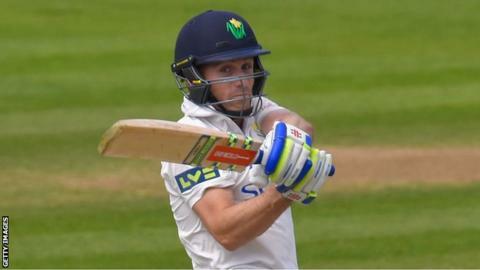 Mark Wallace is calling on Glamorgan to fight hour by hour to try to salvage a draw against Lancashire. The Welsh side reached 165-6 in reply to Lancashire's of 698-5 declared which included a county record stand of 501 between Alviro Petersen (286) and Ashwell Prince(261). "It's not our best performance ... we've got 14 wickets left to save the game," said the former captain. "The wicket's pretty good ... we won't be throwing in the towel." Wicketkeeper Wallace is 39 not out with Glamorgan facing a target of 548 to avoid the follow-on. "If you look at it too far, it's tough," added Wallace. "But if you look at it in small chunks, every session you try to bat through an hour and we've got players capable of batting for long periods of time and getting big runs." Lancashire's 41-year old seamer Glen Chapple claimed the first three Glamorgan wickets to fall in only his second Championship game of the season. Wallace admitted the psychological and physical pressure of conceding a huge score had told on the home batsmen. He also admitted admiration for the standard of the batting display between former Glamorgan captain Petersen and Prince. "Hats off to them, they were absolutely world-class, and it's a reminder of how good these international players are at times," said Wallace. "That batting was as good as you're ever likely to see." The only consolation for Wallace was that Petersen fell short of the ground record score of 309 not out, set by his old friend Steve James against Sussex in 2000. "I had a message off Steve at lunch, I think he was sweating that his beloved 309 was in jeopardy, but he's still got the bragging rights!" Lancashire now look certain to extend their lead in the table over Glamorgan, which stood at 47 points before the game but has already increased by a further seven.